After my seed sprouting failure, I was determined to try something that would work in my sprouting jar. I remembered seeing these directions for sprouting lentils and decided to give it a try. I know lentils are really good for you, but I’m not a huge fan of the texture and flavor of cooked lentils–I figured sprouting them might be a good way to include more of them in my diet. I bought organic red lentils, since they were the only ones available in the bulk section of the local supermarket. They were a little less than $3.00 a pound. I soaked them for 24 hours and rinsed and drained them twice a day until they looked satisfactorily sprout-like. I think it took about 2 1/2 days. I was pleased to find that they taste really good. The taste and texture remind me of fresh baby peas. I think they will be good in stir fry, in pasta salad, or with tomatoes and feta. I’m very pleased to have a sprouting success. 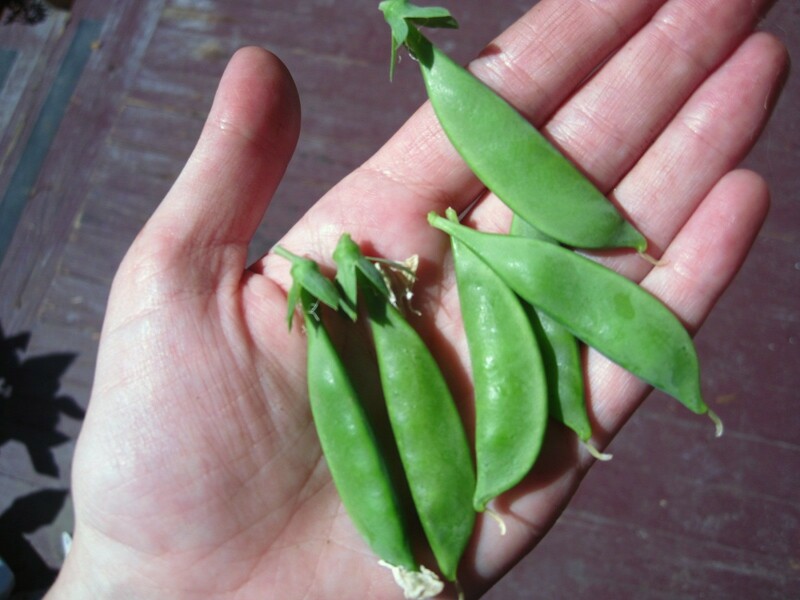 Today we harvested the first peas from the plants that Jared grew from seeds in the late spring. They were delicious. My upside-down tomato plant is getting huge and has several yellow blossoms. I wish tomatoes grew more quickly. We also planted a tomato in the ground; that one is not nearly as big, but looks to be doing well. And we had a lovely purple blossom on our eggplant as well. Exciting stuff! Here are some more lovely tomato blossoms.